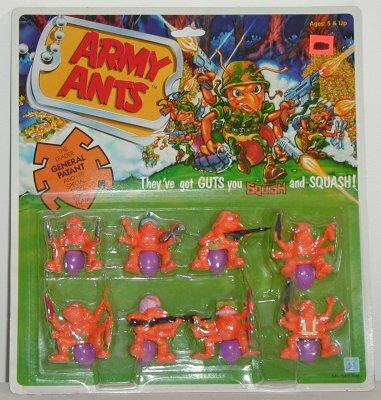 The Army Ants struggle to conquer the vast land that is your backyard. Two opposing armies engage in deadly combat to control important resources. The orange army is lead by General Patant. His forces include an assault team, sniper team, bazooka team, aerial assault team, and his special strike force. The blue army is lead by General Mc-Anther. His forces include a mortar team, artillery team, flame thrower squad, bomber squad, and his personal special forces. Only time will tell the ultimate victor of this epic battle on a micro scale. This series was produced by Hasbro in 1987. They were released on blister cards in packs of 3 or 8. There were four different 3 packs and one 8 pack for each army.